Dubai is world famous for its enormous architectual structures. Some people love this city for its over the edge luxuries and others won't even consider Dubai a travel destination. This city isn't for the rich and famous only but one thing is for sure; I've never seen so many amazing sports cars in my life! 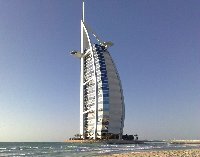 Burj Al Arab aka The Sail of.. The Burj Dubai is the world most followed construction project and pictures of slow progress were posted through the years on countless websites. To have something to compare this with; The Empire State Building in New York make's it, with antenna, up to 443 meters. Another construction famous for its position on the ocean and amazing architectual design would be the Burj Al Arab, also known as the Arab Sail, for its form. This hotel is one of the most luxurious places in the world and the lobby can be visited by tourist on a lower budget. A good way to escape all the 5 star madness and keep your feet on the ground is by making a visit at the Dubai Zoo. Once you've done that, chill out on the beach and you'll feel just as rich! Did you enjoy The Burj Khalifa and the tall towers of Dubai and have you been on a holiday in Dubai, United Arab Emirates? Disliked: Missed the finishing of the Burj Dubai!